1. Emperor Tran Nhan Tong (1258-1310). Emperor of Dai Viet. He twice lead the Dai Viet Army in vanquishing the invading Mongolian troops in 1285-1288. 2. Hung Dao Vuong Tran Quoc Tuan (1232?-1300). He was a famous general under the Tran dynasty and had repulsed the invading Chinese Nguyen dynasty's troops three times in 1257, 1287 and 1288. In February 1984, the British Royal Sciences Academy elected 10 most outstanding Commanding Generals in the global history through generations, among whom was Hung Dao Vuong Tran Quoc Tuan. 3. Emperor Quang Trung Nguyen Hue (1753-1792). He was the second Emperor of the Tay Son's dynasty (1788-1792) after Emperor Thai Duc Nguyen Ngac. He defeated the invasion of the Cham's troops coming up from the South, and of the Chinese troops coming down from the North. 4. General Nguyen Van Hieu (1929-1975). As II Corps Chief of Staff, he played a key role in coordinating the combined Vietnamese American counter-attack and succeeded in vanquishing the first major North Vietnamese Army offensive launched against the Special Forces Pleime Camp in October-November 1965. The entire division sized force NVA Field Front with its three regiments infiltrated from North Vietnam was forced out of the Central Highlands into Cambodia. In March 1971, General Hieu, as 5th Infantry Division Commander, forayed into Cambodia in a scheme to engage the evasive Viet Cong's troops and established a permanent regimental sized outpost in Snoul. He subsequently executed a well conducted troop withdrawal back into Vietnam in late May 1971. General Hieu was assassinated on April 8, 1975 while he was III Corps Deputy Commander. 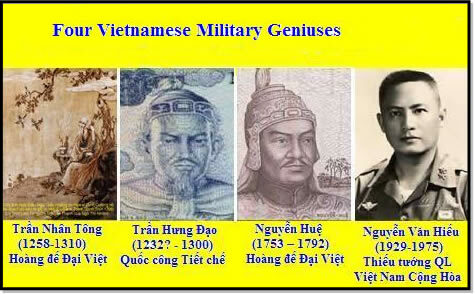 In his article Tứ Đại Thiên Tài Quân Sự Việt Nam, Truc Lam Le An Binh, defines a military genius as a general with outstanding military skills which are not acquired or learned but are God given and innate. Also, such an individual also possesses a genuine love for the soldiers under his command; he values his soldiers'life and does not use them as a means for self promotion and advancement and yet is able to achieve spectacular results on the battlefields. Furthermore, he is above all extremely patriotic, standing above all political parties and factions.